An established classic of Islay, for the peaty and iodized whisky enthusiasts. A must-try. 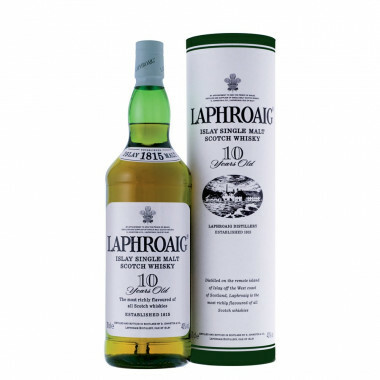 Laphroaig 10 Years Old is the standard version of the distillery. Until today, it has been distilled in the same way it used to be when Ian Hunter invented it, more than 75 years ago. Accounting for its such smoky and rich taste, the distillery's malted barley has been dried over a peat fire. Laphroaig distillery still malts a part of its barley in this exact way (about 30%). This 10 Year-Old Laphroaig possesses a gushy, bold personnality, and reveals a rich palette of exotic and red fruits, seaweed flavours of suprising smoothness, over a heavily peated backdrop. Its unique taste made it famous in the US during prohibition (1920-1933), where it was imported as medicinal alcohol. Nose: the impressive smokiness strikes first, then gives way to a dash of smoothness. Palate: a surprising smoothness joined by notes of salt and peat. Finish: long and very pleasant.